Louis has been hugely influenced by sport, and the chances he has had with Sport Without Boundaries has lead him to places he could never imagined, culminating with him winning a silver medal in the Russian open in Moscow in 2016. He has been a keen to try many wheelchair sports, but now concentrates on Boccia and even helps run a social Boccia club in his spare time. “Sport without boundaries gave me the opportunity to compete on a fair level playing field. They even hosted my first ever Boccia competition. I finished in 9th place but because of the fun, inclusive, competitive atmosphere sport with boundaries created I fell in love with Boccia and haven't stopped playing it since." 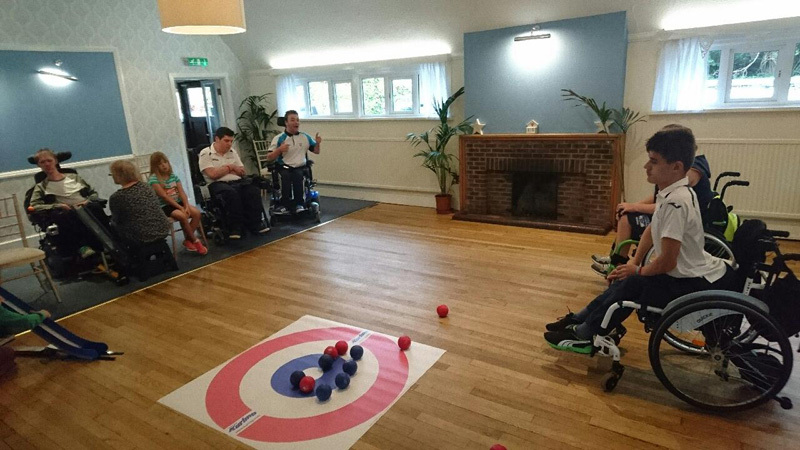 Boccia; more than just throwing balls. A sport that includes, excites and inspires. I’ve been playing Boccia for around the last three years, since I started I was gripped by the tactical nature, the freedom and confidence it gave me. I wasn’t strong enough for wheelchair basketball, not fast enough for wheelchair racing, and not agile enough for wheelchair tennis. I love sport, I want to be the best and sadly I didn’t really have that chance, that opportunity, because of the nature of my disability. But that was before Boccia, now I’ve been given a chance and I’ve made the most of it. I’m a BC4, England athlete, I train 4 to 5 times a week, and I love it. I play at school, I play at home and I play against anyone, I like Boccia because there is so much too it, when to attack? When to defend? What shot to play next? Lay-up? Lob? Knock on? But you also need the technical ability to pull off your desired shot. Boccia is a target sport, you have to propel your six coloured leather balls closer to the Jack than your opponent, it is mostly played by people with severe disabilities. In Boccia there is different classifications BC1-4s, BC1’S and 2’s are players with cerebral palsy, BC3’s use a ramp to propel the ball and BC4’s are like BC2’s but have a different disability to cerebral palsy however Boccia can be played by everyone and anyone. If you’re interested in Boccia, get some balls, find a court, and play. Then go on the Boccia England website, find the club finder, enter your postcode then all the Clubs near you will be shown. Also once you have gained a bit of experience, you can enter a brand new completion, the Heathcoat Cup. This tournament enables new players to play in a competitive atmosphere and gives the opportunity to reach the BE cup final. The Heathcoat cup is also brilliant as it allows classifications BC1-BC8 to play meaning not just people with severe disabilities can get involved. My final advice is to play with confidence, have fun and give Boccia a chance, because as you can see, it’s not just throwing balls.